Nollywood actor, Chidi Mokeme is the latest entertainer to react to the federal government plan to stop entertainers from shooting videos abroad. Recall that the Minister of Information and Culture, Alhaji Lai Mohammed, had said that the Federal Government will ban Nigerian movies and music videos produced abroad. Mohammed was quoted to have made the statement during his recent visit to the headquarters of the Copyright Society of Nigeria (COSON) in Lagos. Alhaji Lai Mohammed has since clarified his statement, saying his statement at COSON was misrepresented. 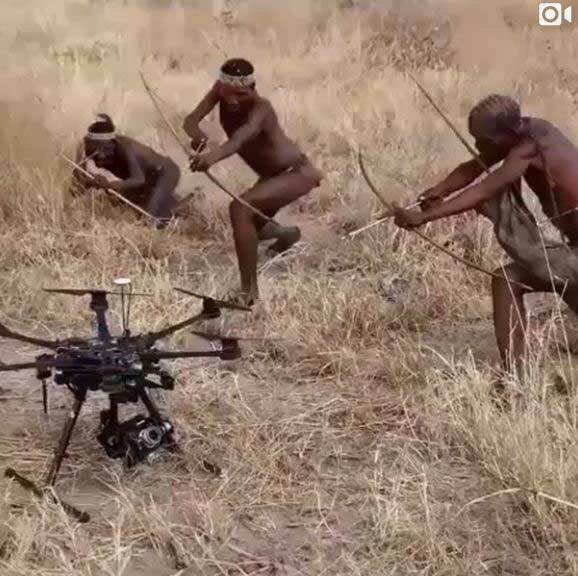 Mokeme, reacting to the news, took to his instagram page and shared this hilarious video of African hunters trying to destroy a drone with arrows.